Yugoslavia (Serbo-Croatian, Macedonian, Slovene: Jugoslavija, Југославија), once spelled and called "Jugoslavia", was a country in Southeast Europe during most of the 20th century. It came into existence after World War I in 1918[lower-roman 1] under the name of Kingdom of Serbs, Croats and Slovenes by the merger of the provisional State of Slovenes, Croats and Serbs (itself formed from territories of the former Austro-Hungarian Empire) with the formerly independent Kingdom of Serbia and Kingdom of Montenegro. The Serbian royal House of Karađorđević became the Yugoslav royal dynasty. Yugoslavia gained international recognition on 13 July 1922 at the Conference of Ambassadors in Paris. The country was named after the South Slavic peoples and constituted their first union, following centuries in which the territories had been part of the Ottoman Empire and Austria-Hungary. Renamed Kingdom of Yugoslavia on 3 October 1929, it was invaded by the Axis powers on 6 April 1941. In 1943, a Democratic Federal Yugoslavia was proclaimed by the Partisan resistance. In 1944, the king recognised it as the legitimate government, but in November 1945 the monarchy was abolished. Yugoslavia was renamed the Federal People's Republic of Yugoslavia in 1946, when a communist government was established. It acquired the territories of Istria, Rijeka, and Zadar from Italy. Leader of the Partisans Josip Broz Tito ruled the country as the president until his death in 1980. In 1963, the country was renamed again to the Socialist Federal Republic of Yugoslavia (SFRY). 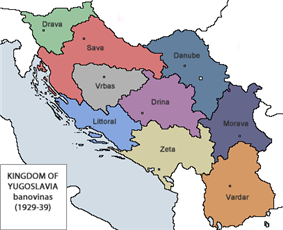 The constituent six Socialist Republics that made up the country were SR Bosnia and Herzegovina, SR Croatia, SR Macedonia, SR Montenegro, SR Slovenia, and SR Serbia. Serbia contained two Socialist Autonomous Provinces: Vojvodina and Kosovo, which after 1974 were largely equal to the other members of the federation. After an economic and political crisis in the 1980s and the rise of nationalism, Yugoslavia broke up along its republics' borders, at first into five countries, leading to the Yugoslav Wars. The king was assassinated in Peter II and a regency council headed by his cousin, Prince Paul. The country distanced itself from the Soviets in 1948 (cf. Cominform and Informbiro) and started to build its own way to socialism under the strong political leadership of Josip Broz Tito. The country criticised both Eastern bloc and NATO nations and, together with other countries, started the Non-Aligned Movement in 1961, which remained the official affiliation of the country until it dissolved. In 1974, the two provinces of Vojvodina and Kosovo-Metohija (for the latter had by then been upgraded to the status of a province), as well as the republics of Bosnia and Herzegovina and Montenegro, were granted greater autonomy to the point that Albanian and Hungarian became nationally recognised minority languages, and the Serbo-Croat of Bosnia and Montenegro altered to a form based on the speech of the local people and not on the standards of Zagreb and Belgrade. In Slovenia the recognized minorities were Hungarians and Italians. Yugoslavia had always been a home to a very diverse population, not only in terms of national affiliation, but also religious affiliation. Of the many religions, Islam, Roman Catholicism, Judaism, and Protestantism, as well as various Eastern Orthodox faiths composed the religions of Yugoslavia, comprising over 40 in all. The religious demographics of Yugoslavia changed dramatically since World War II. A census taken in 1921 and later in 1948 show that 99% of the population appeared to be deeply involved with their religion and practices. With postwar government programs of modernisation and urbanisation, the percentage of religious believers took a dramatic plunge. Connections between religious belief and nationality posed a serious threat to the post-war Communist government's policies on national unity and state structure. A more severe sign of disobedience was so-called Constitution was ratified in 1974, which gave more rights to the individual republics in Yugoslavia and provinces in Serbia. An economic crisis erupted in the 1970s which was the product of disastrous errors by Yugoslav governments, such as borrowing vast amounts of Western capital in order to fund growth through exports. Western economies then entered recession, blocked Yugoslav exports and created a huge debt problem. The Yugoslav government then accepted the IMF loan. As a result of these events, the 1989 Kosovo miners' strike, which dovetailed into ethnic conflict between the Albanians and the non-Albanians in the province. At around 80% of the population of Kosovo in the 1980s, ethnic-Albanians were the majority. The number of Slavs in Kosovo (mainly Serbs) was quickly declining for several reasons, among them the ever increasing ethnic tensions and subsequent emigration from the area. By 1999 the Slavs formed as little as 10% of the total population in Kosovo. In September 1991, the VMRO). This was despite the fact that the Yugoslav Army refused to abandon its military infrastructure on the top of the Straža Mountain up to the year 2000. In June 2006, Republic of Kosovo declared independence from Serbia, leading to an ongoing dispute on whether Kosovo is a legally recognised state. However, numerous countries, including the United States and various members of the European Union, have recognised Kosovo as an independent nation. In 2009, The Economist coined the term Yugosphere to describe the present-day physical areas that formed Yugoslavia, as well as its culture and influence. ^ Huntington, Samuel P. (1996). ^ a b "FR Yugoslavia Investment Profile 2001". EBRD Country Promotion Programme. p. 3. ^ Jessup, John E. (1989). A Chronology of Conflict and Resolution, 1945–1985. New York: Greenwood Press. ^ Žilnik, Želimir (2009). """Yugoslavia: "Down with the Red Bourgeoisie!. Bulletin of the GHI (1968: Memories and Legacies of a Global Revolt). ^ "Participation of Former Yugoslav States in the United Nations". Max Planck Yearbook of United Nations Law. pp. 241–243. ^ Ljubica Spaskovska (28 September 2009). "'"The 'Yugo-sphere. The University of Edinburgh School of Law. Retrieved 11 November 2011. Ramet, Sabrina P. (2006). The Three Yugoslavias: State-Building and Legitimation, 1918–2005. Bloomington: Indiana University Press. g Kosovo is the subject of a territorial dispute between the Republic of Serbia and the Republic of Kosovo. The latter declared independence on 17 February 2008, but Serbia continues to claim it as part of its own sovereign territory. Kosovo's independence has been recognised by 108 out of 193 United Nations member states.